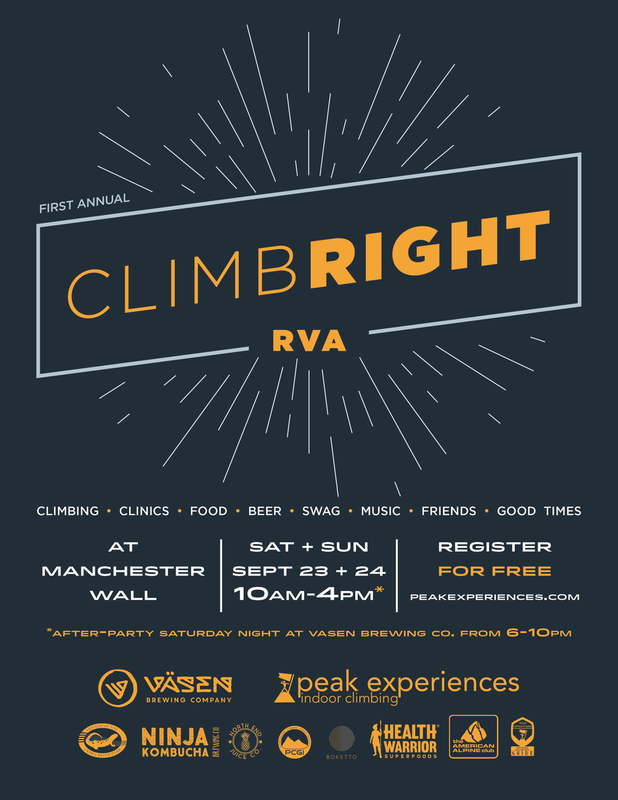 After our Manchester Cleanup on 11/11, we will be hosting Climb Right RVA! This two-day FREE event consists of different climbing clinics at Manchester Wall in the heart of Richmond. We will have certified guides teaching beginner to advanced clinics on belaying, lead climbing, trad gear, movement, cleaning sport routes, rappelling, self-rescues, and more. There will be gear demos and local food and drink vendors as well. 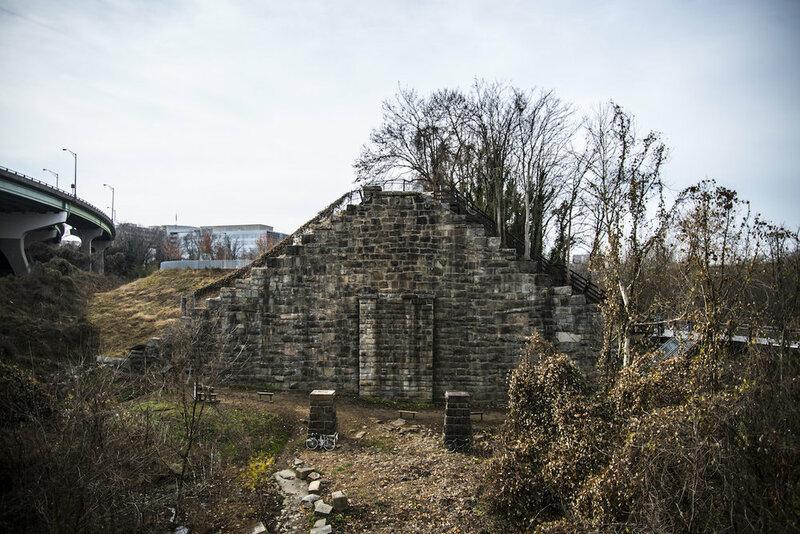 In anticipation of our free Climb Right RVA event November 17th & 18th, we are coordinating a volunteer cleanup of Manchester Wall and the surrounding areas. Please help out and support your local crag. Clean Up will start at 9am. Unfortunately, due to a rainy forecast, we are cancelling the Saturday portion of Climb Right RVA. We will still be having the party at Väsen Brewing Company from 6pm-10pm on Saturday night, so we hope to see you there. Sunday is looking clear and good to go! Thank you for your support. Saturday April 7 from 6PM-10pm @ Väsen brewing co. It's that time again! As Winter thaws out and turns into Spring, we all get excited to go out and climb. 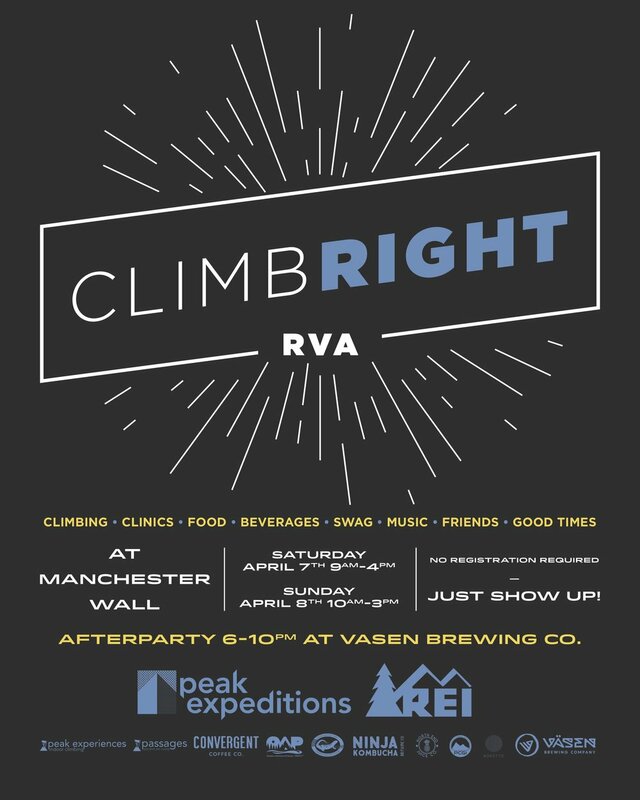 To prepare for these trips, Peak Expeditions is hosting a Climb Right event at Manchester wall on Sunday, April 8th, as well as a party to kick off the event at Väsen Brewing Co. on Saturday, April 7th. This event is FREE and classes will run every 2 hours, first come, first serve for participants. 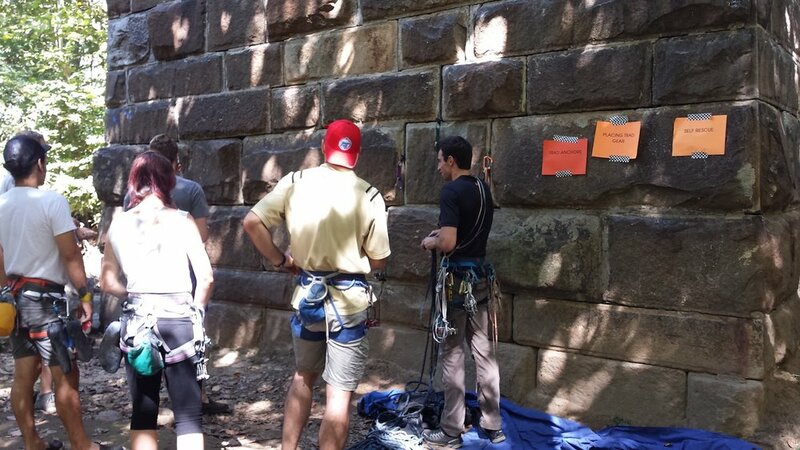 Participants should bring personal gear such as harness, shoes, and belay device. We will have top-rope climbing available for first-time climbers and gear will be provided. We hope you can join us for this fun and unique learning opportunity! 1) Intro to Outdoor Climbing - an entry level course which discusses the challenges of climbing outdoors and the environmental responsibilities. We will cover everything from what climbing outdoors looks like to LNT, and general ethics of being at the crag. 2) Sport Climbing Outdoors - this course builds on the intro course and instructs specifics of sport leading, belaying, and anchor building. 3) Minimizing Risk - this is a highly recommended course for anyone climbing outdoors or wanting to climb outdoors. The most accidents happen during transitions and descending routes. We will instruct the best ways to clean anchors and lowering or repelling routes. We strongly recommend this course to all climbers regardless of experience! 5) Intro to Trad Climbing - this course is an introduction to Trad gear and placements. We will discuss different types of gear and how they all work. 6) Advanced Trad - this course takes it to the next level with a strong focus on anchors and actual hands on placement of gear. We will customize the course specifically for the needs of the people attending. 7) Self Rescue - this will be the most advanced course we will be offering. We will discus theories and practice different scenarios that you might find in the mountains. We will have a Q&A at the beginning to get a solid feel for what people want/need to learn. *Online bookings will close at 6pm on Friday September 22 but walkups are welcome Saturday and Sunday. Climb Right RVA is a two-day FREE event consisting of different climbing clinics at Manchester Wall in the heart of Richmond. We will have certified guides teaching beginner to advanced clinics on belaying, lead climbing, trad gear, movement, cleaning sport routes, rappelling, self-rescues, and more. There will be several climbs set up for the general public to experience top rope climbing as well. In anticipation of our free Climb Right RVA event we are coordinating a volunteer cleanup of Manchester Wall and the surrounding areas. JROC, JRP, Peak, and others will be volunteering to clean the area and get it ready for both the event and the future new pathway. We will also be installing a new kiosk with signage about the wall. There will even be goats on-site munching out on everything! Please help out if you can. Clean Up will start at 8am.